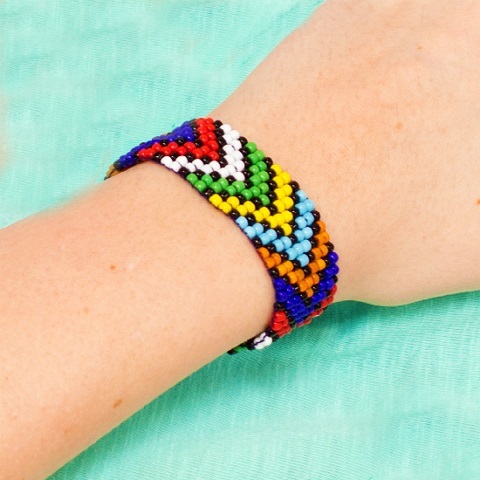 I love the bright colors used in beadwork by the Zulus in South Africa. Strong colors and vivid geometric patterns which are also used to send messages especially in love and courtship (see first link below for more information). This tutorial by Olivia of Hopeful Honey is inspired by the traditional work. It is a clear and easy to follow loom bracelet tutorial. Perfect for beginners. Olivia is an Aussie who was born in Pretoria, South Africa and spent her early childhood there. Just one thing. I think these are 8/0 beads not 10/0. 8/0 beads are a good Goldilocks compromise. Not too large or too small. If you are not fond of weaving all those threads (I'm with you there), consider this quick and easy method which uses ribbons and ribbon clamps I wrote about before. I was really intrigued with the story about the language of the beads and the jewelry designs. It really was a 'learn something new every day' for me sort of moment. These bright colours and designs would be such fun to wear. Making them for me is probably not going to happen though. Still - I get inspiration from it all anyway. Does beadwork inspire your polymer clay work?